SIR ALAN COBHAM PHOTOGRAPH Signed. 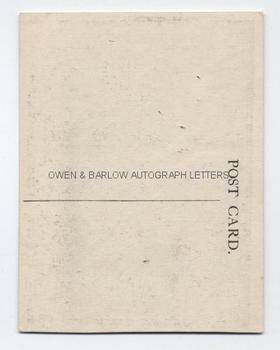 Post-card offset-litho photograph, with autograph signature. The portrait shows Alan Cobham, head and shoulders in flying coat and cap with goggles pushed up. The full signature "Alan J. Cobham" is large and bold but is across a dark portion of the image. The post-card measuring approx 4.5 x 3.5 inches has been trimmed at foot but without loss to the image or signature. It is otherwise in fine condition. Alan Cobham set several long-distance and endurance air records, including flights across the continent of Africa and his 1926 flight from Britain to Australia. 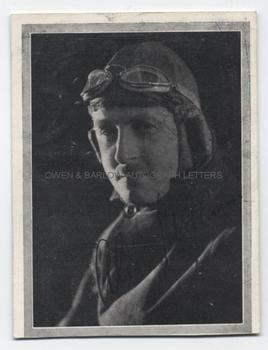 He had also been a fighter pilot in WW1 and after the war was a test pilot for the de Havilland Aircraft Company. Cobham was one of the first to experiment with in-flight refuelling.